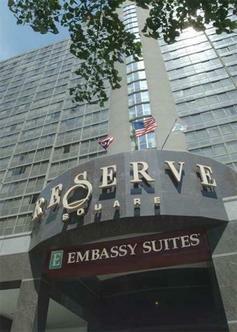 The Embassy Suites Hotel Cleveland Downtown is walking distance from the Rock and Roll Hall of Fame & Museum, Cleveland State University - CSU, Tower City, Cleveland Galleria, Playhouse Square, Cleveland Brown's Stadium, Great Lakes Science Center, Cleveland Public Square, Jacobs Field - home of the Cleveland Indians and Gund Arena - home of the Cleveland Cavaliers. This full-service upscale all-suite hotel is just minutes from the Flats Entertainment District, the Cleveland Clinic, the Cleveland Hopkins International Airport, Cleveland Metroparks Zoo, Case Western Reserve University & University Circle. Cedar Point, Geauga Lake and the Blossom Music Center are located just a short drive away. Guests of the Embassy Suites Hotel Cleveland Downtown stay in spacious two-room suites and receive a complimentary cooked-to-order breakfast and a nightly manager's reception. On-site amenities include: a fitness center with indoor pool, casual upscale dining at our restaurant or lounge, a business station and high-speed internet access.